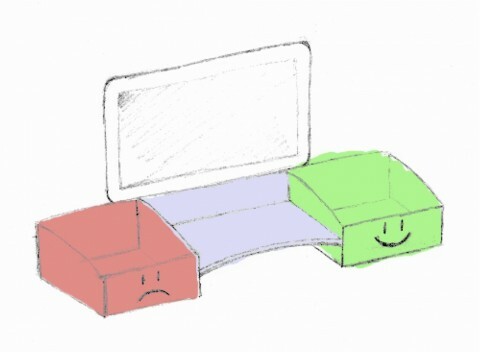 TeddIR is a system using a tangible interface that allows children to search for books by placing tangible figurines and books they like/dislike in a green/red box, causing relevant results to be shown on a display. This way, issues with spelling and query formulation are avoided. It was published in the proceedings of the 9th International Conference on Interaction Design and Children (IDC 2010), where it was shown during the demo sessions. Despite several efforts to make search engines more child-friendly, children still have trouble using systems that require keyboard input. We present TeddIR: a system using a tangible interface that allows children to search for books by placing tangible figurines and books they like/dislike in a green/red box, causing relevant results to be shown on a display. This way, issues with spelling and query formulation are avoided. A fully functional prototype was built and evaluated with children aged 6–8 at a primary school. The children understood TeddIR to a large extent and enjoyed the playful interaction. Because the concept was to be evaluated with real children, the prototype needed to be fully functional and appear as a real system. It uses Flash for the animated front-end and Ruby on Rails with an SQL database indexed by Lucene for a powerful back-end. The hardware consisted of two powerful directional RFID readers, kindly provided by the Library Solutions department of Nedap, a bunch of RFID labels, library books and a pile of wood, toys and polyurethane foam. You can find it at TeddIR in the ACM Digital Library or as a direct download. TeddIR was designed and built by Wim Bos and Michel Jansen as part of a Human Media Interaction-course on Information Retrieval at the University of Twente.